In this context, the answer to the question “Is BPM part of EA or EA part of BPM?” is still not simple – it’s “neither”. However this is not what many architects expect. The heart of most architecture work as it’s carried out today is modeling, so it stands to reason that architects will see BPM primarily through the lens of business process modeling. Identify what you’re going to measure first. Knowing what to measure is important because what you measure is what you are going to try to improve. In this case, you need to focus on the metrics that will deliver real business value. Everyone starts off with the right intentions but if you derive the wrong actions from the wrong KPIs, you might harm your organization more than help. An ACMS that uses BPMN or CMMN for describing process plans will never be suitable for the very knowledge workers it is aiming to support. The idea that you can get a specialist (programmer or process analyst) to code up process plans for the knowledge workers falls apart when you realize that knowledge workers need to “tweak” the process plans. They can’t tweak something in a language they don’t understand. The two-language approach divides the workers from the processes they are working on. Every so many years, vendors need to bite the bullet and perform their own architecture reinvention and rebuild–something quite disruptive and expensive to their software suite, but that buys them another 5 years of leadership or at least relevancy. When they ignore that need and kick that can downhill, their product suite falls behind in modern features, or gets weighed down with “bolted on” features or inelegant integrations with acquired products. Anyone who’s spent years in IT has seen this with ERP, CRM, middleware, app servers–all types of products, and BPM is no exception. In my past career, I had worked with several process improvement experts, and mostly we saw the use of techniques such as six sigma, lean, or traditional processes engineering methods being deployed, for both understanding and improving processes. When we compare that to process mining, the big difference we see is that process mining takes you to a whole new level of granularity in understanding how the process works and also understanding performance of resources who are assigned to that process. I think it truly helps you get to opportunities that are not found by using traditional means of process improvement. We are seeing traditional case management, the integration then is an attempt to reach out of the normal boundaries. One example is integrating medical with mental health. Another is integrating emergency room with regular health care. Another is integrating social work, medical work, and other disciplines. Another is integrating across families. far too many companies have multiple versions of the same process and no single version of the truth for the ideal process. Sometimes it’s the by-product of many acquisitions that catapult the company into new global markets or new lines of business; sometimes it’s the predictable end result from years of siloed thinking created by a highly decentralized organizational structure. The team held a late night meeting in the boardroom to discuss the progress of the BPM program. The wind blew, the rain poured, and the lightning struck. It was late and the team felt uneasy at being left alone in the building on such a night. The storm had cut off the power to the building. It was an uncomfortable situation. They had all heard stories of gruesome endings to previous improvement teams. The team huddled together to the light of a candle, trying to piece together the process change plan. Thump. Thump. Thump. The footsteps drew nearer. The team gasped in fear and flung themselves under the table as the thud of heavy footsteps grew louder. “I don’t know” yelled the business analyst in fear. The team looked around. The business analyst was missing, nowhere to be seen. In her place, the letter “B” had been written in blood on the table. The frightened team huddled together, when suddenly another gust of wind blew the candle out again. “We are working on it” yelled the process analyst in fear. A scream was heard and the candle was quickly relit. The team looked around. The process analyst was missing, nowhere to be seen. In his place, the letter “P” had been written in blood. The team huddled together even tighter, when another gust of wind blew the candle out again. “Help us” yelled the enterprise architect in fear. The team looked around. The enterprise architect was missing, nowhere to be seen. In his place, the letter “M” had been written in blood. The next morning, management discovered the boardroom still unlocked. The evidence of the night’s events were plain to see. But the most important similarity between BPM and Lean Startups is the fact that we don’t know the answers up front. We have hypotheses – estimated problems and estimated solutions. The goal of a lean startup (or a BPM initiative) is to iterate until the problem is known, and the solution is known. Some of the traditional approaches just don’t work because the problem isn’t fully known – which is why we always say that incorrect requirements are the biggest risk to your BPM initiative. Interestingly, the question about what process to start with always comes up with I give a general BPM presentation; I always recommend starting with something that really matters to the business since, as I’ve stated previously, no one ever justified enterprise-wide deployment of BPM by doing a proof of concept with managing expense reports. I talked to MacKenzie about this at the break and told her that I agreed with this strategy, and she unknowingly echoed my opinion that in the grander scheme of BPM, no one cares about expense reports. We are, at least, at a point at which customers are recognizing that the “workflow” add-ons to their systems of record just don’t cut the mustard. You can’t reasonably expect to deploy diverse workflow solutions from Oracle, SAP, and Microsoft, and mash them up to do anything useful. BPM bridges that gap. ERP and CRM and other three-letter suites provide the data that drive processes implemented with BPM. Some systems of record (I’m looking at you, CRM) may even be vulnerable to being supplanted by BPM entirely. When talking about an ACM system, and we talk about plans (processes) being made, we are talking about the actual knowledge worker making those plans as they work. The food safety expert has to be the one to make the plan, and has to do it directly. There is no programmer available to “program up” the process because that would increase the overhead, and would cause the safety expert to be less responsive to the emergencies. It really is the knowledge worker who creates the plans. Knowledge is an equal partner of business process. All of the knowledge in the world won’t make something happen; it has to be acted upon…as process. Likewise, all of the process steps in the world without appropriate knowledge are out-of-context activities without direction. Not only have knowledge and process already reunited in many environments, it is a fair statement to say that an environment where knowledge and process are managed separately is quickly becoming outdated and wont be competitive against organizations that empower their people with reunited KM and BPM. Many pundits push the notion that a lot of business processes are ad hoc and that you can’t manage ad hoc processes within BPM software. I disagree – I have worked with BPM software that allowed me to document and manage ad hoc processes. Our process engineer had been configuring processes for years. Over those years, he had learned how to look at processes in other ways. At a minimum, we would put in rules that allowed a person to add an activity and/or a person within a process step. Most of the BPMS software solutions have a nice look and feel to them. The problem is that BPMS solutions are usually implemented behind the scenes and need to integrate into the customer’s front-end software systems. Apart from the common integration problems, it’s a bit discouraging when you find out that you need to dumb down the look and feel of your system, to “fit in” to their existing corporate systems. The importance of a user friendly software solution is usually a low priority for IT managers that want all the systems to have the same look and feel, even if they are old and clunky.. Probably the worst example of a front-end system that I needed to integrate into was in a large company that had spent nearly a million dollars on corporate rebranding. All the software systems had been redesigned to fit the new colour scheme. Even the building was repainted. And the colour that was chosen was… BRIGHT RED!!! Ahhhhhhh! So why did the British wear red coats in battle? During the recent royal wedding, millions around the world saw that Prince William chose to wear a uniform that included the famous British “red coat”. A long time ago, Britain and France were at war. During one battle, the French captured a British Colonel. They took him to their headquarters, and the French General began to question him. Curiously, the French General asked, “Why do you British officers all wear red coats? In his casual, matter-of-fact, way, the British officer informed the General that the reason British officers wear red coats is so that if they are wounded, the blood won’t show, and the men they are leading won’t panic. it pains me to say it but Gartner seem to be clutching at straws to say something new and innovative and relevant – this idea and this MQ misses the mark by a country mile. The notion of “intelligent” BPM suggests that the “unintelligent” BPM systems are or were incapable of making routing decisions, reacting to external events, responding to deadlines, prioritizing work etc. Which is of course nonsense. In the MQ report, Gartner warns, “Do not compare the new iBPMS Magic Quadrant with the prior 2010 BPMS Magic Quadrant. They service different audiences.” With all due respect, that is absurd. There is not a separate audience for iBPMS. One of the surprising things is that a couple of vendors don’t support BPMN at all. What concerns me is that here is how many vendors are using non-standard process modeling languages – but without being able to promote any special benefits for their notation. If you’re going to do something different, do it with a purpose. Don’t be different and inferior! Or different solely due to historical reasons or current lack of investment. What’s even more exciting is that BPM technology can be also used with brain-machine interfaces (BMIs) to create the next ‘killer applications’ that will allow human participants to interact with smart devices. By interacting with BMIs, BPM can guide, coach, and provide intent-driven interactions for machines and human participants optimizing the execution of complex tasks. This could be used for the development of technologies assisting humans intelligently with much wider implications than simply automating work-related tasks. A mobile strategy requires a complete rethink in process design, how both the user and internal resources are expected to interface with your business this way and how you are intending to service your consumers through that interface. It’s an entire service channel experience all on it’s own, not an extension of your current web strategy. Get it wrong, and as the term mobile suggests, the consumer’s business can easily move to a competitor who gets it. And they’ll have an app for that too. First, my congratulations to Pega, Appian and IBM, the leaders of Gartner’s iBPMS Magic Quadrant 2012 that was published last week. There has been some criticism of Gartner and its recent iBPMS report. I feel an obligation to defend Gartner’s honour. Gartner did a great job in creating this magic quadrant. It is a solid professional research, created by intelligent people, for intelligent people. The main problem stems from people’s inability to understand the enormous effort put in to the pre-report research: the dedication, the emotion, the choice of colours. You must remember that Gartner had only 2 years to write this research paper, and cannot be held responsible for mistakes due to the tight writing schedule. You must also take into account the hardship in coordinating four writers into one research paper. This requires compromise. Understandably, in order to please some of the writers, new topics may have needed to be added. One must be also forgiving if a non-BPM vendor needed to be added to the vendor list. I can assure you that Gartner’s choice of iBPMS vendors has nothing to do with conference sponsorship, conference sponsorship or any other financial incentives. Gartner has been brave in setting the new BPMS standard. Most BPM vendors might say that they have analytics, but how many of them can say that they have ‘deeper’ analytics, or ‘better’, ‘improved’ and ‘broader’ analytics. That is the real difference between the men and the boys. It is also important to note that one of the seven additions that distinguish an iBPMS from current generation BPMS is role-based user access, something that I’m sure that none of the other BPM vendors have ever thought of. The importance of these new naming conventions compared to the old naming conventions cannot be underestimated. 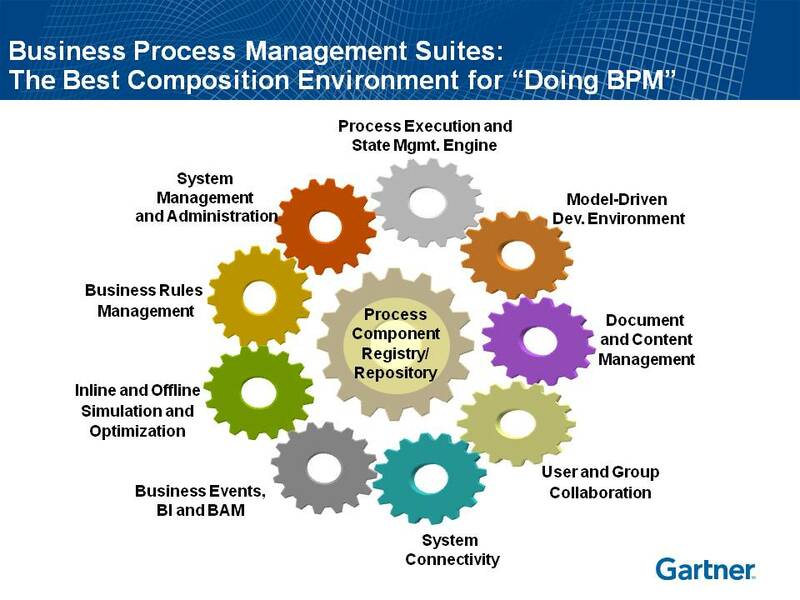 Gartner also emphasises that organisations with lower BPM maturity may find that BPMS fits them better than iBPMS. The criticism of Gartner’s latest report is totally uncalled for. – that Gartner used fuzzy words like ‘better’, ‘deeper’, ‘broader’ and ‘improved’ to explain the difference between BPMS and iBPMS. – that CEP has been around for more than 5 years and is not a new trend. – that the research was based on only 37 end-user interviews. – that Gartner has lost touch with the field and making up things on the way. – that Gartner’s choice of the word ‘Intelligent’ was condescending and patronizing. All of these allegations are completely unjustified, and it makes me angry to think that people could even say such things. – The analyst market is getting smaller. – Nowadays companies are using Google to do their own research and analysis. – Vendors are not seeing as much ROI in sponsorships, compared to the past. – Gartner market predictions have not materialized. I am sure that the next Gartner Magic Quadrant in 2014-2015 will change the whole new perception of the industry with the introduction of ViBPMS (Very Intelligent BPM Suites), which will provide powerful reading. It will be worth waiting for. So the results of the MQ were eagerly awaited by the BPM software vendors like excited school kids around the noticeboard with exam results. But many of the vendors who read the report and were probably disappointed, confused and angry – in that order. there are over 100 vendors in the market today, enforced segmentation or not, they all deserve to be seen. Making up a new market term doesn’t raise the bar (just a larger invoice) but creates another set of divisions and another set of headaches for people looking to enter the BPM arena and for those trying to understand it. Whether the trend is labeled “Dynamic,” “Adaptive,” “Intelligent,” or something else, organizations that have captured the majority of the benefits from traditional BPM technologies will see additional value from deploying this newer breed of integrated technologies into their business processes. The PaaS concept as being “the center of the universe” causes me to think of BPM PaaS. Of course, many business executives have been reluctant to attempt to automate many of the processes for fear that the data those decisions are being made on is either incorrect or incomplete. But as the volume of data for those decisions increases, the confidence in those decisions increases because the level of extrapolation being made based on the available data is significantly less. It means these leaders approach BPM excellence as a business in its own right, not just as another technology or business program in the company. They realize that BPM has investors and stakeholders. These leaders realize they must drive broad adoption for BPM over time in order to achieve success. Most importantly, they realize the need to build a business plan that outlines how they will deliver results quickly in order to continue growing and expanding the BPM initiative. Unlike traditional enterprise software, BPM solutions are not restricted to a specific function or department. Since business processes are often cross functional involving multiple business departments, the software that supports how people work and collaborate within an enterprise must also cross boundaries. A BPM software platform should have the right foundation, features, and capabilities to support a wide range of use cases and requirements for any department, any company, any size. ACM is an industry initiative, and in such an environment it is important to try to communicate over a lot of noise. Marketing is a way to communicate. I fear that the academic community often regards marketing as a lot of empty claims, maybe even a kind of lying. If it is marketed, it can’t be true. It is a fair criticism to say that much that is written about ACM is untrue, but not all of it. it means that those completely au fait with social media need to be involved in BPM and process design from now on, that BPM methods that are just steeped in ancient tradition need to be dragged kicking and screaming into the 21st century to recognise that understanding social networking and new media is a required part of process management now, how can you have Voice of the Customer if you’re ignoring every channel available. Six Sigma, Lean, BPM and process improvement techniques must change and have input from social strategists. Social BPM must mature from being just an internally focused collaborative design approach to being a fully integrated practice of embedding the wisdom of the organisational ecosystem into business processes. It is on this basis I posit that by using relevant, contextual information sourced from social technology, organisational business processes can be triggered, enhanced and potentially transformed. In my experience, the main purpose of BPMN is to document, analyze, and improve business processes. The process improvement, if it’s taken that far, is not necessarily automation in a BPMS. Well less than half of my students are looking to automate their processes. The people who use it call themselves BPM project team members, business analysts, architects, and consultants. They often live in the IT organization but their perspective is that of the business. They are not technical. And they don’t need to be.